Commencement is a ceremony that celebrates the completion (or near completion) of a degree. Participation in a commencement ceremony does not indicate that a student has officially graduated or completed all degree requirements. Graduation marks the completion of all degree requirements and coursework as recorded on a student's official transcript. Learn more about expected graduation quarters, changing graduation quarter, applying for graduation as a masters student, diplomas and more by visiting the Office of the Registrar's Graduation Process site. When students reach 72% or more of degree completion (78% for Architecture and Landscape Architecture majors), as indicated on their Academic Progress Gauge on Poly Profile, the Office of the Registrar will input an expected graduation term for them that is a full four years after their initial admit term, or one year away, whichever is greater. Transfer students will be given an expected graduation term that is three years after their initial admit term. 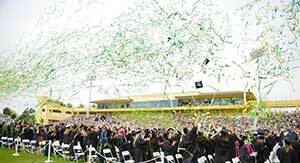 Students will receive an email from evaluations@calpoly.edu, informing them that this expected grad term has been set. If a student is scheduled to graduate in winter, spring, or summer quarter, they are automatically scheduled to participate in the spring commencement ceremony. 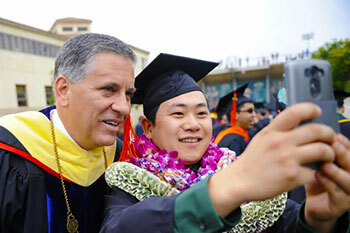 Students will automatically begin receiving information about Spring Commencement via email in Spring quarter. If a student is scheduled to graduate in fall quarter, they are automatically scheduled to participate in the fall commencement ceremony. Students will automatically begin receiving information about Spring Commencement via email in Fall quarter. Class rings, portraits, diploma frames, announcements, flowers, memorabilia, and much more can be found and purchased through the University Store.